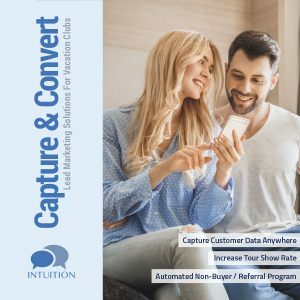 Following a soft launch in October 2018 of an exciting new SMS Marketing solution, INTUITION has now revealed new applications for the technology that help to accurately capture customer data from the original lead generation source and intelligently communicate with the customer and track engagement throughout the sales process and beyond. Once the customer engages with the SMS system by simply texting a keyword to a short code number (e.g. Text SIGNUP to 99000), INTUITION’s system uses AI-based marketing automation to communicate with the customer, encouraging them to attend a sales presentation or reminding them of their appointment time. Whether used by OPCs or captured at Front Desk or via In-Room Marketing, Sales centers now have high penetration access to leads and checked-in guests wherever they are by grabbing their attention on their favorite device, their cellphone. Once at the sales center, INTUITION’s Evaluate Sales Performance (ESP) Survey is deployed at the end of the sales presentation to collect valuable information about the experience, plus propensity to purchase in the future. In addition to highlighting areas for improvement to sales presentation format and individual salesperson or sales team performance, this information is then used in the automated Non-Buyer & Referral Program to dynamically customize future marketing messages intended to generate repeat visits at much lower marketing costs, plus grow new leads through referrals of friends and family. “There are near infinite possibilities for engaging customers with our enhanced services. All campaigns are custom-built to match the needs of our clients, including set-up and campaign design and the automated real time engagement then funnels guests in the direction you want them to take to drive more sales and monitor and improve satisfaction – faster and more accurately than ever before.” Says Paul Mattimoe, President & CEO, INTUITION Brand Marketing. INTUITION also offers the first and only 100% Cash Back Program protected by insurance for vacation club sales operations through Vacation SafeGuard, a strategic partner. The program gives the member a guaranteed, tangible cash value that they work towards by remaining loyal to the resort or club where they currently own. This significantly improves first day sales, gives a new reason to upgrade and increases the average length of a membership, thereby generating more annual fees and ancillary transactions per average member per year.